Prime Minister Justin Trudeau plans to talk trade, security and gender equality during his four-day trip to the United States and Mexico that begins Tuesday. But there is little doubt one of those subjects will get more attention than the others. Trudeau is facing multiple trade-related challenges with both countries. Talks on the North American Free Trade Agreement (NAFTA) have slowed and soured, with the mood expected to get worse, and Canada is frustrated by the U.S. decision to slap 300 per cent duties on Bombardier’s CSeries planes. The softwood lumber dispute has also not yet been settled. Trudeau arrived in the Washington area late Tuesday afternoon. He will also take questions during a keynote address at Fortune Magazine’s Most Powerful Women Summit in the evening. Trudeau will shift gears early Wednesday when he visits the congressional ways and means committee on Capitol Hill — an opportunity to share his message about the importance of Canada/U.S. trade with influential lawmakers. On the eve of talks, U.S. President Donald Trump continued to threaten the viability of the deal, this time to Forbes. “I happen to think that NAFTA will have to be terminated if we’re going to make it good. Otherwise, I believe you can’t negotiate a good deal… . [The Trans-Pacific Partnership] would have been a large-scale version of NAFTA. It would have been a disaster,” he said in an article published Monday. Despite the president’s renewed threats, Congress has some power to intervene. “Congress is potentially our shield against an administration which is the most protectionist that we’ve seen,” said Colin Robertson, a former Canadian diplomat. 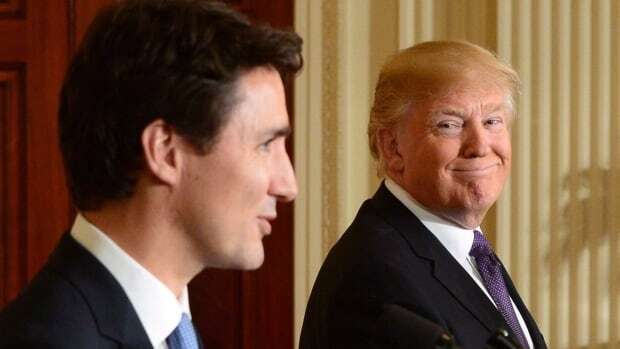 Robertson thinks it is smart for Trudeau to ramp up his so-called charm offensive with U.S. politicians outside of the White House. “This is something he will have to continue to cultivate,” Robertson added. 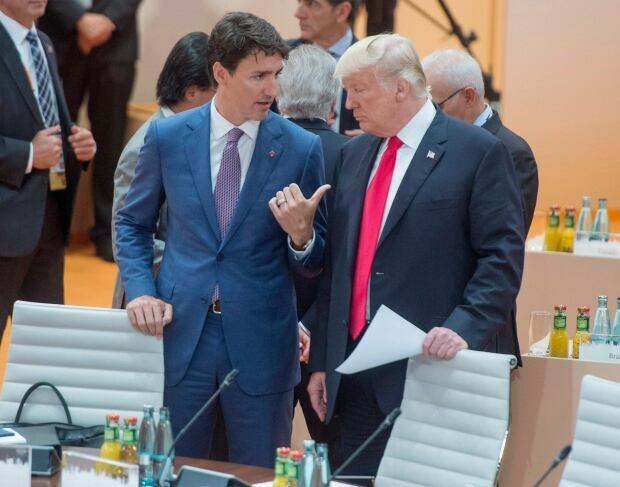 But the most anticipated moment of the trip will be Trudeau’s face-to-face meeting with Trump. The pair have developed a positive rapport, according to a spokesman in the Prime Minister’s Office, and are looking to further develop that relationship. But their meeting takes place at the same time the fourth round of NAFTA talks begin, also in Washington. The PMO confirmed Tuesday those talks have already been extended so ministers from Canada, the United States and Mexico could all attend a meeting next Tuesday. There is little positivity left at the negotiating table, especially as the U.S. is expected to make its most contentious demands during this round of discussions. “I think they [the talks] are going poorly, they’re having difficulty even nailing down the low-hanging fruit,” said Jerry Dias, president of Canada’s largest private-sector union, Unifor. U.S. proposals on the rules for automobile content, dispute resolution and the dairy industry are expected to be unveiled this week. The U.S. has already been accused of making demands that neither Canada nor Mexico would ever agree to. The PMO spokesman said Trudeau plans to discuss NAFTA, but noted that the real work is being done by negotiators behind the scenes. Trudeau also plans to bring up Canada’s frustration with the U.S. Department of Commerce over the Bombardier duties. Trudeau also plans to discuss security with Trump, integrated operations and NATO, according to the spokesman. Freeland and her parliamentary secretary on Canada-U.S. relations, Andrew Leslie, will accompany Trudeau to Washington. Trudeau will round out his North American tour with a stop in Mexico City. 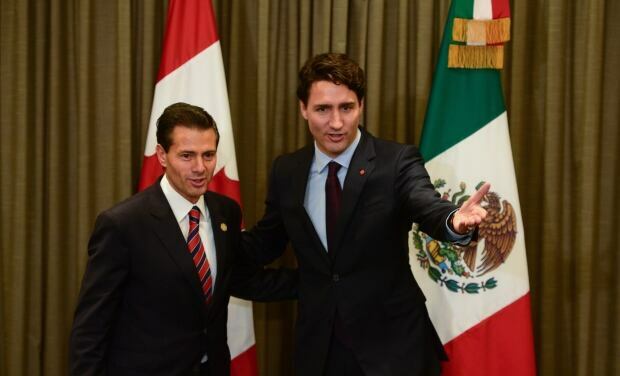 President Enrique Pena Nieto has a full day of meetings planned with Trudeau and, again, trade will likely be the key point of discussion; so much so that International Trade Minister Francois-Philippe Champagne will join Trudeau and Freeland for this leg of the trip. Canada and Mexico hold wildly different positions on several aspects of NAFTA, most notably labour standards. But the prime minister’s spokesman says other issues will come up, including gender equality. Trudeau is also expected to take some time to visit some of the regions hard hit by two earthquakes that struck this past summer.